When approaching the master-bath remodel of this historic St. Louis Tudor, Karr Bick Kitchen & Bath made certain the new design honored the original details found throughout the rest of the home. A Tudor arch window became the focal point of the room, so Karr Bick placed a freestanding tub beneath the window and lined the walls with custom wainscot furniture panels. A window bench was created in an unfinished floor area discovered during demolition. A chandelier centered in the arch leads your eye that way. The previous bathroom closed off the shower into a corner. It did not fit the style of the house, so Karr Bick removed the walls surrounding it and replaced it with clear glass to enlarge the space, brighten it and highlight it with beautiful Calacatta marble tile walls. Cabinetry painted in a soft, fog gray with a caramel glaciered glaze has a built-in furniture look. To make the cabinetry and tub pop, a darker Greystone Marble porcelain floor tile was selected. The flooring nicely contrasts with the time-worn look of the Bianco Imperial honed-stone countertops and classic marble shower tile. A built-in closet was removed to make more space for the second vanity. 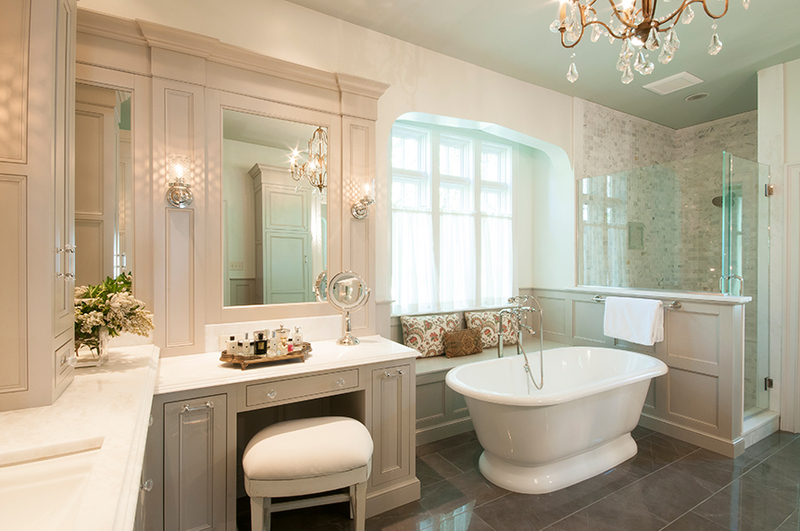 The renovated bathroom is now as regal as the rest of the grand, old home. 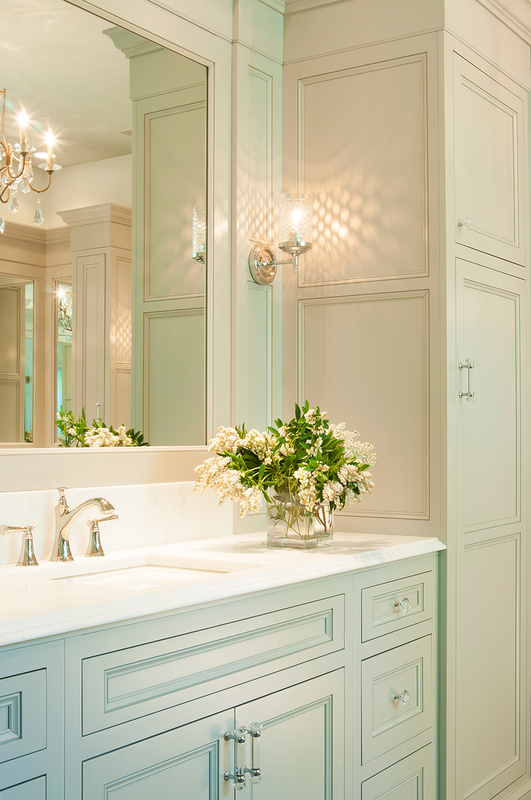 This master-bath redo is very respectful of the Tudor era. The craftsmanship in the cabinetry and millwork is beautiful. We love how the designer captured the original arch.